The frenzy of March’s NCAA basketball tournament has finally arrived, and brands are jumping on board, as we saw a few weeks ago with Reese’s March Madness sweepstakes. For our readers that may not be familiar with March Madness (what’s up Bebteam), NCAA’s annual national championship tournament is a weeks-long tournament consisting of 64 different men’s basketball teams competing against each other and is commonly referred to as March Madness. The bracket has become synonymous with March Madness and brands have jumped on board to leverage the appeal and engagement opportunities that brackets present during March. Bojangles, famous for their Chicken ‘n Biscuits, is one of the brands that has launched a topical, but unique, bracket campaign to engage both basketball and non-basketball fans during the tournament. Bojangles’ built out a bracket featuring pitting their best menu items against each other and fans who participate are being given the chance to win an Xbox OneX and Bojangles’ gift cards. 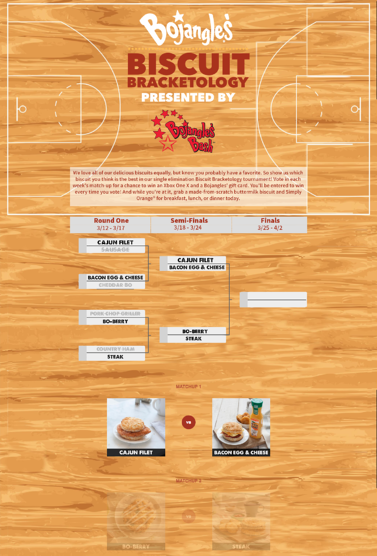 Building a bracket marketing campaign featuring their menu items was a smart way to engage both existing and a new customer base by leveraging March Madness to get in front of new audiences. 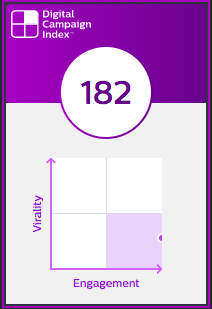 Bojangles' DCI score is a combination of an Engagement Score (ES) of 307 and Virality Score (VS) of 56, and is a great example of a well-timed campaign designed to appeal to Bojangles’ core fan base, as well as new audiences tuned into the March Madness. Check out more details on some best practices any brand can incorporate into their bracket campaigns to optimize for engagement and virality. Brackets are so fetch. Sometimes jumping on board with a tactic or event that is popular can be the smart thing to do. Over 60 million Americans fill out brackets each year and their popularity has remained consistent, so for brands looking to give their campaigns a boost, adding an engaging, interactive bracket experience during major holidays or popular events, like March Madness, is a smart way to tap into and excite your fan base. Make sure your bracket stands out for the right reasons. The first step to creating a great bracket that will boost your marketing initiatives engagement is knowing your audience. The better you know your target consumers and fans – from their interests, pain points, and habits -- the more likely it is that your bracket and campaign will stand out and resonate with consumers. Bojangles’ knew this and did a great job at designing a bracket that would be a hit with their fans. Don’t forget to add a sharing element. Brackets are a great tactic for boosting engagement and brand affinity due to the process of selecting, clicking and tracking the results of the competition. It can be easy to forget to build in sharing components and incentives to encourage your fans to also share their brackets online, whether for bragging rights or extra chances to win. When launching a bracket, ensure your campaign also features opportunities and features to easily share across social networks. Promote your bracket. A bracket only works if your fans are participating. Ensure you are promoting your bracket across all your channels, it will help get your brand in front of a lot of new and existing eyes. Additionally, brackets serve as great content that your brand can leverage since they tend to be less sales and product-focused, and lean more heavily on the fun, interactive side, which generally performs better on social with new audiences. Bojangles’ crushed the game by tapping into a huge culture moment, but giving their fans and new audiences an interactive experience that was unique to their brand. We feel confident saying the hype around March Madness won’t be going anywhere and it will remain a great opportunity for brands to launch interactive campaigns to connect and build brand affinity with their audiences.